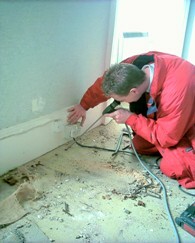 Nationwide Dry Rot, Woodworm Removal, & General Timber Repairs. 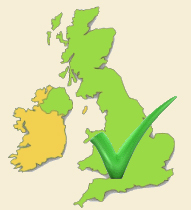 At the Woodworm removal company, we have a team of over 400 pest control exterminators on hand across the UK (England, Northern Ireland, Scotland and Wales). We can provide extermination or Woodworm treatment and removal services within 24 hours (usually same day) and offer property surveys to thoroughly assess the extent of any damage. When you have identified a woodworm infestation or have found dry rot in your property, you should get it treated as soon as possible. The longer the woodworms are left, the more damage they will do to your furniture, timber, or whichever sort of wood they are burrowing through. 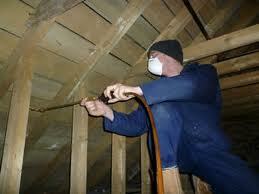 It is essential therefore to apply woodworm treatment as soon as you can. The most obvious sign of woodworm damage are tiny holes in the wood, where the woodworms have come through. Actually, woodworms are just the larval stage of a variety of species of wood boring insects, and by the time they come out they are the adult beetle. The discovery of wood boring insects, the most prevalent of which is the common furniture beetle, is another clear sign that you have woodworms. Frass, or bore dust, is another feature which you can look out for. Some wood, such as the timber supporting your house, is out of sight so in severe cases the first sign of woodworm could be loss of structural integrity. If you do suspect a woodworm infestation, therefore, you should contact a professional to come and survey your property as soon as possible. Once it has been determined that you have an infestation, there are a variety of woodworm treatments that are available. If it is not too severe, then insecticides can be applied to the surface of the affected wood. For more serious infestations, however, it may be necessary to fumigate the property. This will require people and pets to be kept out of the area for a period of time, however, so will not be carried out unless absolutely necessary. In some cases, the problem will have been caught so late that the integrity of the wood will have been compromised. In this eventuality, the wood will have to replaced in order to ensure that the property is safe. These are the most common forms of woodworm treatment, and they depend not only on the magnitude of the infestation but the type of wood boring beetle which is responsible for it. For example, if it is the Deathwatch Beetle, another of the most common forms of woodworm in the UK, fumigation is often the only appropriate treatment. There are other techniques that can be tried as well though. Freezing, for instance, can be effective. This will only be possible with relatively small pieces of furniture of course. There are also pesticides that you can acquire yourself to treat the wood, however even in this case you should call a professional pest controller to check your property for woodworm if there is any possibility that they have got to the timber inside your property. A borescope can be used to tell if there is an infestation in wood even if it is hidden from sight. Pest controllers will then be able to recommend the best woodworm treatment for your situation, so if you are in any doubt, call in a professional. Formed over 20 years ago, our company has built a reputation on fast, friendly pest control services at affordable prices.